The Industrial Hydroheater - JetCooker - Hydro-Thermal Corp. The Industrial Hydroheater® is ideal for heating liquids and slurries over a wide range of viscosities and solid contents to precise temperatures. With the unique manual or automatic combining tube adjustor, you can easily control the process shear which makes this heater the perfect choice for achieving optimum starch conversion. The Hydroheater® is an exclusively designed and patented direct contact steam injection heater that may look like any 3-way valve but instead is a unique engineered heating device that sets it apart from competitors. The internal parts precisely mix metered amounts of steam directly with a liquid or slurry, providing instantaneous transfer of heat from steam to the liquid. Steam immediately condenses, eliminating hammer and vibration and causes a turbulent mixing action that self-cleans the unit. Two distinct properties for effective and uniform heating of liquids or slurries are used. These properties are internal modulation and choked flow. INTERNAL MODULATION assures precise steam control and produces predictable results based on the position of the stem plug. A variable-area steam nozzle meters steam flow at the point where steam and liquid first contact and mix. This technique eliminates the need for an external steam control valve. 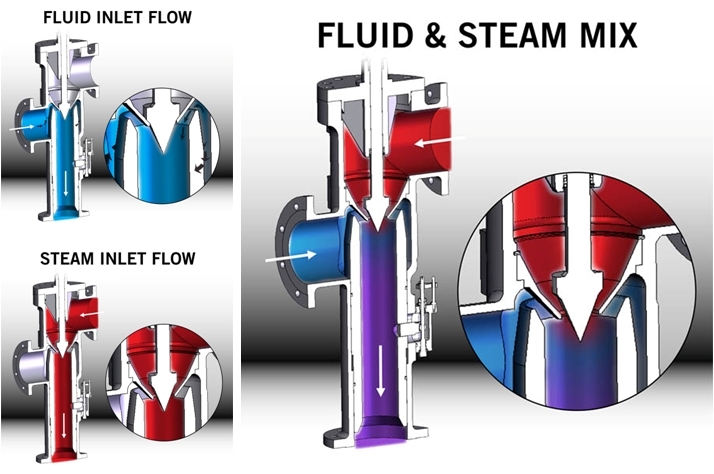 Only the cross sectional area of the steam nozzle changes which provides process stability through a much wider variation of your process conditions. CHOKED FLOW (propels, accelerates, launches) your process heating to the speed of sound. Precisely engineered nozzles generate a steam pressure differential that “chokes” the mass flow rate of steam and accelerates it to sonic velocity unique to Hydro-Thermal Hydroheaters. When the steam flow is choked, Hydroheaters can internally modulate the steam flow by adjusting the flow area between the steam and process fluid giving you precise and rapid temperature control. Steam traveling over 1500 ft/sec creates a forceful jet preventing hard water scale and burn on from building up. The self cleaning feature frees you from frequent process interruptions and chemical baths resulting in total uptime! The Industrial Hydroheater is used in a variety of applications including pulp and paper processing, biofuels, ethanol and starch conversion, large volume water, anaerobic digestion, cooking, and more. In fact, the Industrial Hydroheater is Hydro-Thermal’s most commonly used heater. To learn more about applications categorized by industry, click here. The Industrial Hydroheater is made for your specific operating conditions. We need to know a little bit about your process and plant set-up in order to design the heater or skid that will work best for your conditions. Please fill out this form or contact us here.